Septic tank pumping in York PA is quite common as every property has the system. We at Smith’s Sanitary advise that you have your septic pumped at least once every two to three years depending on its size and the nature of waste that goes into it. There are many reasons why you should regularly have your septic tank pumped, but these three are core. You want to ensure the health of your family by preventing any flow from infecting the water around the absorption field, as well as keep the value of your property high. During valuation, your property will either do well or poorly depending on the state of your drainage system. The third reason for having your septic tank pumped regularly is to save money; lots of money. Regular pumping every two to three years will cost you a pretty penny but not as much as it will when you have to replace the entire leaching system after years of neglect. Whenever water is used, it has to return to the environment in some form. Water from the kitchen, bathroom, sinks, and practically everywhere in the house finds its way into the septic tank where it mixes, regardless of its source. Bacteria and time lead to this waste water being separated to form sludge – the heaviest of the waste product that settles at the bottom of the tank – and a liquid form that is treated and filtered into the soil. Septic tanks are not self-cleansing and so the owner will need to pay it attention and have a professional look into it every now and then. Failure to clean and pump the tank turns ugly when those solids that have settled in the bottom start to float to the top and finally, overflow into the leaching system. We have been offering solutions for septic tank concerns since 1959 and have over time accumulated a wealth of knowledge. We have also nurtured and retained a team of talented, passionate experts that continually keeps learning to stay at the top of the game. We are insured too and have a strong brand built on trust and years on experience. When you call concerning your septic tank, most likely than not you will be in dire need of services. We respond depending on the nature of your call. We have same-day services for emergencies where raw sewage is overflowing and next-day services when you can wait a few hours. We also keep a calendar for scheduled maintenance and will inform you when your system is due for checking. Our septic pumping services are excellent and will give you the peace of mind you deserve for another two years, yet our prices are quite reasonable. Every matter is unique and so is the pricing, but the one thing we do diligently is issue an invoice with the anticipated services and their cost. This way, you will never be caught off-guard. When raw sewage starts seeing into the drain field, you will have waited too long to pump your septic tank. You also don’t want to wake up to a backed-up system to call Smith’s Sanitary. The sooner you have a professional check and pump your system, the longer it will serve you well and the more peaceful you will be knowing that your money is safe. Contact us today for professional septic tank pumping in York PA. 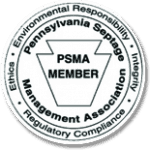 Need Septic Tank Pumping in York PA?